Wonderful panoramic hike through the largest pine forest in Central Europe: From Tulfes with the bus to Igls. With the gondola to the Patscherkofel top station (1964 m), the Zirbenweg at 2000 meters above sea level leads almost flatly to the Tulfeinalm. From there take the chairlift to” Halsmarter” and the new gondola lift to Tulfes. The tour is also possible vice versa. Ascent from Tulfes with the Glungezerbahn gondola to the middle station “Halsmarter”. 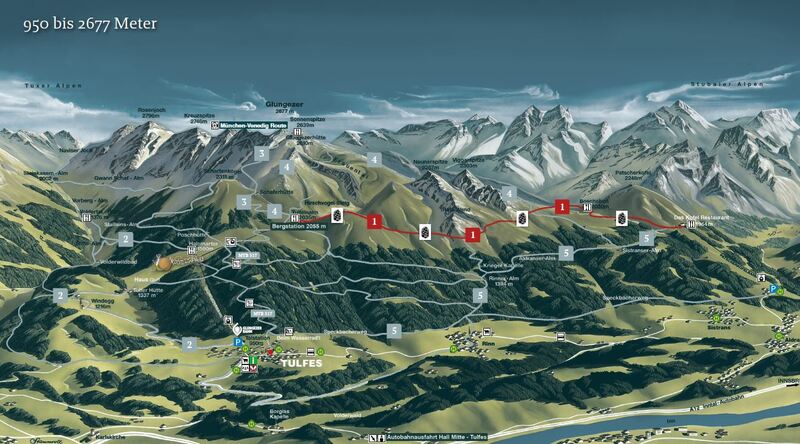 From here the way leads into the Voldertal valley and over picturesque alpine pastures up to the Voldertalhütte. The way back leads via the Stiftsalm and the "Windegg" back to the valley station of the Glungezerbahn. After the ascent with the Glungezerbahn gondola to the Tulfeinalm (two sections) the hike starts via the Schaferhütte and the Glungezerhütte to the Glungezer summit (2677 m). Back after a break at the Glungezer hut on the same path. A summit experience for the whole family! Ascent with the Glungezerbahn to the Tulfeinalm (two sections). From there the way leads via the Schaferhütte and the Glungezerhütte to the Glungezer summit (2,677 m). Back via the way below the Viggarspitze and the StonePine Path to the Patscherkofel top station. From there back by gondola lift to Igls and by bus to Tulfes.Ascent with the Glungezerbahn to the Tulfeinalm (two sections). From there the way leads via the Schaferhütte and the Glungezerhütte to the Glungezer summit (2,677 m). Back via the way below the Viggarspitze and the StonePine Path to the Patscherkofel top station. From there back by gondola lift to Igls and by bus to Tulfes. This walk starts at the Patscherkofel top station (1965 m) and leads to the Lanser, Sistranser, Aldranser and Rinner mountain hut. Further via the “Speckbacher” trail to the town centre of Tulfes (923 m). Especially recommended tour at the time of the Alpine Rose blossom!